No print server? No problems! As a Small to Medium Business (SMB) you might not have dedicated IT support or are using a lean or cloud-based network infrastructure. In any case, you don't need to budget for added infrastructure. 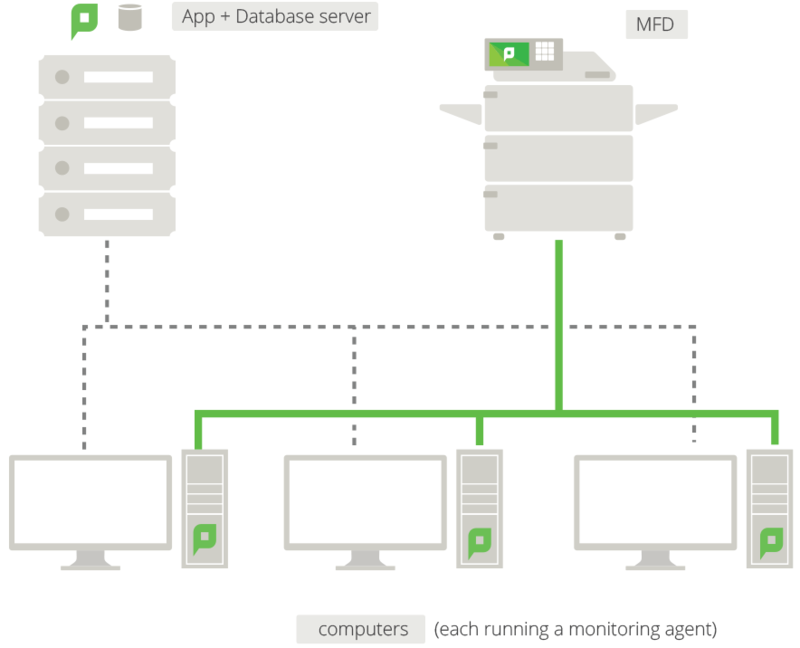 A simple SMB configuration with computers and an App and Database server. Direct Printing is ideal for organizations with distributed branches, including post offices, bank branches, gas stations, and retail outlets. Headquarters (with a print server) can track and report on printing, but avoid the cost and maintenance of having a print server in each branch. PaperCut's Direct Printing provides cost effective print control in remote network environments. The combination of Direct Printing and a Private Cloud implementation of PaperCut products can eliminate the need for any local server infrastructure by hosting the App Server offsite. In a centrally based print server setup, PaperCut products work by intercepting the job as it passes from the computer, through the print server, then onto the device. In a decentralized direct printing configuration there is no central location to intercept the job. Instead jobs are controlled at the computer level and all usage is reported to a central App Server. Need to know how to setup PaperCut to track and control printing in a direct printing environment? Read more on using PaperCut in Print Server Free Environments in the PaperCut NG Manual. Already have a print server? Find your printer setup.